• Oil - 1 teaspoons. • Beetroot(grated) - 1 cup. • Coconut(grated) - 1 tablespoon. • Coriander leaves(chopped) - 1 tea spoon. • Chat masala - 1/4 tea spoon. Chop onion and green chilies then keep aside. Heat oil in a pan, add roasted peanuts, onions, green chilies and saute it then add beetroot and again saute it. Add curry leaves, salt and saute it, later switch off the flame. 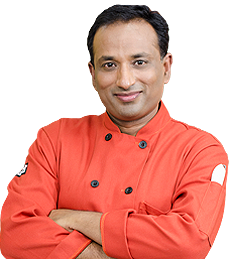 Add coconut, coriander leaves, sesame seeds, chat masala, lime juice and mix it, transfer to a serving bowl, and top it with sesame seeds. Now beetroot salad is ready to serve. Beetroot salad is a colourful and healthy recipe as beetroot is a red color with an acquired taste that has been linked with better stamina, improved blood flow, and lower blood pressure. Beetroot salad in Indian Style Beetroot Salad is an awesome healthy food that is very colorful, yummy contains no fat, less calories and a g... Read More..
Beetroot salad in Indian Style Beetroot Salad is an awesome healthy food that is very colorful, yummy contains no fat, less calories and a great source of fiber. 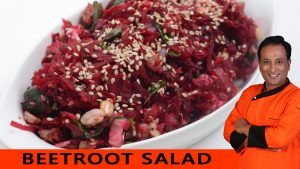 Healthy raw vegetable salads make a great starter and this beetroot salad is no exception as it has a fantastic earthy flavor, lots of crunch from peanuts and sesame seeds and incredible color to attract. Eating raw vegetables salad in your daily meal is a fantastic food as it contains lots of nutrients and maintains a healthy body. Vegetables are a vital part of food especially for growing kids and teenagers. Fresh salads are not only fun to binge on but also are cool, crunchy and have lots of texture, colors and flavors. You would be provided with amazing health benefits by adding salads to you meal daily. They are full of fiber, vitamins and minerals. It is often said that eating a high fiber diet lowers cholesterol levels and prevent constipation. Add different colorful vegetables to your salad like dark green, orange, yellow, red vegetables and legumes are nutrient rich foods that contribute to our overall health. Beetroot is a lovely deep red in color vegetable usually eaten either boiled or added raw into salads. The color of this vegetable is striking and has a pleasant sweet taste on bite. They are used in preparing various sweet and hot dishes. Beetroots are also processed in used for dyeing and is industrial purpose. The color is used to make the red food colorant that is added to various dishes as sauces, tomato paste. Desserts, jams, jellies, ice creams, sweets and breakfast cereals. Beetroot’s main benefits are that it contains no fat, very few calories and is a great source of fibre. This vegetable has for many years been used as a treatment for cancer in Europe. Specific anti-carcinogens are bound to the red coloring matter which supposedly helps fight against cancer and it also increases the uptake of oxygen by as much as 400 percent. Additional studies are taking place to add support to these claims. Beetroot can be eaten raw. You just need to peel it and it’s ready to use. Beetroot can add a refreshing touch to a salad, a sandwich (try it with cheese!) or as an accompaniment to other veggies. Some of my favorite beetroot dishes are namely Grated beetroot curry , Beetroot chutney excellent accompaniment to a meal; or you could also make a healthy raw beetroot salad or beetroot halwa. Beetroots are a rich source of potent antioxidants and nutrients, including magnesium, sodium, potassium and vitamin C, and betaine, which is important for cardiovascular health. Betaine functions in conjunction with S-adenosylmethionine, folic acid, and vitamins B6 and B12 to carry out this function. This vegetable is a good tonic food for health. It contains carbohydrates, mainly in the form of sugar, and it has a little protein and fat. Beet is taken in a variety of ways. The skin should be removed before use. The fresher the beets, the better the flavor and the quicker they cook. Beets are for great therapeutic value and have properties to clean the kidneys and gall bladder. Being rich in alkaline elements, potassium, calcium, magnesium and iron, they are useful in combating acidosis and acid the natural processes of elimination. In a pan, add little oil and put in the roasted peanuts. Add onions and green chillies and sauté well. Add grated beetroot and toss all the ingredients. Add curry leaves, toss again and switch off the flame. Add grated coconut (fresh), coriander leaves, sesame seeds, chaat masala and lemon juice. Mix well and serve. was the betroot boiled ???? Easy to make but delicious food!? Nice food. Actually i don't like beetroot but by seeing the way prepared i am getting the feel to have it. i will try this surely. thanks for sharing sir.? don't send notifications it's kind of irritating? Isn't it similar to kerala thoran?? Yum. Warm beetroot salad sounds awesome. Thank you chef. ?